Just two months following a direct hit by Hurricane Florence, a nationally-renowned holiday attraction returns to Wrightsville Beach this weekend. Organizers of the North Carolina Holiday Flotilla said on Friday that despite the disruptions caused by Hurricane Florence, the boat parade will have a level of participation similar to prior years. Flotilla committee member Jimmy Gilleece said that boat registrations were approaching 20, putting the boat parade on par with previous years. Parked vehicles that obstruct a portion of the roadway can block access for emergency vehicles, particularly fire engines and ambulances that require more space than passenger cars. While obstructing any roadway can be dangerous, during the North Carolina Holiday Flotilla this problem is of particular concern on the narrow streets of South Harbor Island. During the Holiday Flotilla Boat Parade & Fireworks Show, signs will be posted on the following streets reminding motorists not to park on the pavement. Due to the serious public safety hazard posed by improperly parked vehicles, violators will be ticketed and/or towed. Thursday, November 22nd, 8:30 a.m. the annual Cape Fear Habitat for Humanity Turkey Trot begins. Over 2,000 participants of this event will run the Loop 5k course which begins and ends at Town Hall. The eastbound lane of West Salisbury Street, the southbound lane of North Lumina Avenue between Salisbury Street and Causeway Drive, and the outside westbound lane of Causeway Drive will be closed to facilitate this race. Vehicles may experience some minor traffic delays from 8:25 a.m. to approximately 9:30 a.m. Wrightsville Beach Police Officers will be directing traffic where necessary. Friday, November 23rd, 5:30 pm Tree Lighting Ceremony at Wrightsville Beach Town Hall Performance Club’s Elf Patrol will sing a variety of Christmas tunes followed by the lighting of the Town Christmas Tree welcoming Santa’s arrival to Wrightsville Beach. While waiting for a visit with Santa, enjoy a cup of hot chocolate as you listen to a special holiday musical performance by the Wilmington Celebration Choir. Saturday, November 24th, 10:00 am – 4:00 pm North Carolina Holiday Flotilla Festival in the Park at Wrightsville Beach Park. Shop numerous unique craft vendors, eat delicious festival food, and entertain the kids with a variety of fun activities including games, bounce houses, and a ride on the Arab Choo Choo Train. 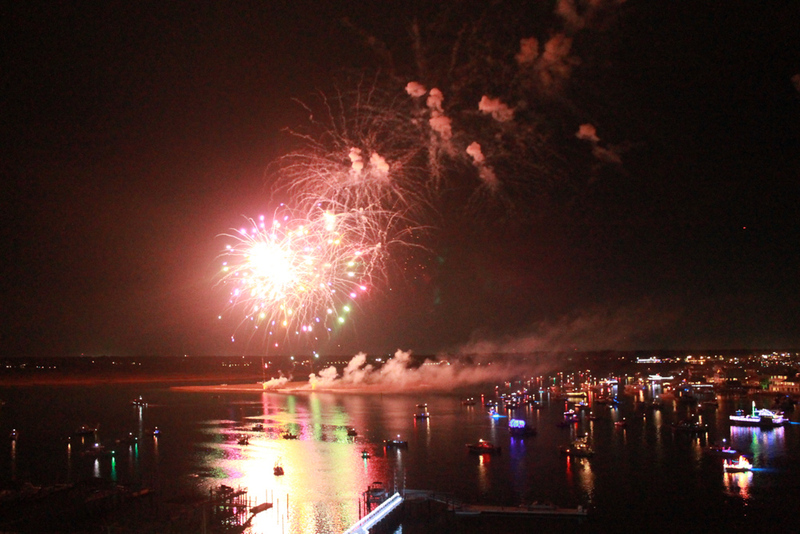 Saturday, November 24th, 6:00 pm – The North Carolina Holiday Flotilla Boat Parade and Fireworks Show is sure to please with a spectacular lineup of brightly decorated vessels lighting up the waterways followed by a magnificent display of fireworks. For further information, please call the Parks & Recreation Office at 910-256-7925 or email kryan@towb.org.